Prepare a 40% solution of Captisol® in water by dissolving 400 mg (corrected for water content) into a total volume of 1 mL. Serially dilute the sample as in Table 1. To six small vials, add sufficient drug candidate to exceed the potential amount that could be solubilized by Captisol®. To each vial, add 1/2 mL of the corresponding Captisol® solution, cap the vials, sonicate and place on a tumbling apparatus at controlled (or room) temperature. Let the vials agitate for 1 to 3 days (depending on the stability of your drug candidate). Remove the vials at the end of the agitation period and either centrifuge or filter the suspensions to obtain clear solutions. Analyze the solutions for drug content. 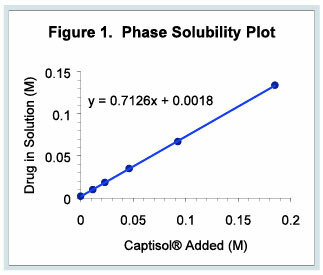 The results are typically plotted as moles of drug in solution vs. moles of Captisol® added. A typical phase solubility plot is shown in Figure 1. If the solubility increases with the addition of Captisol®, complexation has occurred. The strength of the complex, quantitated as a complexation constant (K1:1, in units of 1/molar)), can be calculated from the slope and intercept (S0 or intrinsic solubility) of a line drawn through the points on the graph. This equation is valid for the 1-to-1 complexes that are typically formed between drugs and Captisol®. These data can then be used to develop formulations where a required solubility must be maintained. What additional steps can I take to increase the solubility of my drug with Captisol®? Does the molecule have an ionizable group? Captisol®is anionic so if you can adjust pH to create a positive (+) charge on your compound, the electrostatic charges may assist in attracting and retaining your compound in Captisol®'s hydrophobic cavity. If your compound is negatively (-) charged, adjusting the pH to give a neutral or positive charge may block any electrostatic repulsion with Captisol®. Many of our clients have found that changing the solution pH can greatly improve binding and solubility. We have also found it useful to test different salts of the drug, not just the salt with the highest intrinsic solubility. If the compound in question is stable to heat, another method is to prepare a Captisol® solution (20-40%) containing 0.1-2% polyvinyl pyrolidone (PVP) or carboxy methylcellulose (CMC), or hydroxypropylmethyl cellulose (HPMC). Add solid drug and autoclave the sample at 1210 C for 20-45 minutes. Allow the suspension to cool and stir for 24-48 hours to achieve maximal solubility. Can I add an organic solvent to a Captisol® solution to help increase the solubility of my drug? Typically, the addition of an organic solvent (such as ethanol, methanol, acetonitrile, DMSO) will result in a decrease of the complexation of the drug with a cyclodextrin. The solvent 3 molecules are also hydrophobic relative to water and will often insert into the cavity preferentially over the drug molecule –basically because there tends to be a large excess of solvent molecules to compete with the drug molecules for the CD cavity. What is the solubility of Captisol® in water, methanol, acetonitrile, or other organic solvents? My drug is very non-wettable, are there any techniques I can use to improve dissolution? If the drug is highly crystalline or non-wettable you may experience difficulty solubilizing the compound with Captisol®. Consider triturating solid Captisol® with the solid drug in a mortar/pestle. During grinding, add a small amount of a solvent in which the drug is soluble and water (e.g., 95% EtOH). The solvent should contain some water to solubilize the Captisol®. We have successfully used 95% ethanol/water or solutions of methanol/water or DMSO/water. Add just enough of the solvent to form a paste or wet mass and continue mixing. Slowly add water over time. Weigh out 5 mg of Drug and 220 mg of Captisol®. Grind the two solids with a mortar and pestle to increase particle surface area and disperse heterogeneous materials. Transfer solid mixture to a 'volumetric' container that can be diluted to 1 mL and have sufficient space to allow 'shaking' to agitate solid in solution. Add a drop or two of 'Aqueous Solvent' to create a very concentrated Captisol® solution with minimal aqueous characteristics and maximal chance for hydrophobic drug to find the Captisol® Warm solution/suspension and sonicate if necessary. Temperature constraints depend on stability of drug not the Captisol®. Slowly add 'Aqueous Solvent' to 1 mL volume. 'Aqueous Solvent': Ideally, the only solvent added should be water, however, depending on the drug characteristics a buffer may be used. For drugs that are extremely water insoluble, the first drop or two may need to be ethanol or DMSO but more preferably an aqueous ethanol or DMSO solution with as little of the organic solvent as possible (i.e. 50:50 EtOH: Water). The method is set up to use as small amount as drug as possible (5mg) for these initial studies. If you do not have any constraints on drug availability - increase the weight proportionally and work at larger volumes. If any of these methods work, optimize the formulation by decreasing the molar excess of Captisol® from the 10-fold excess down as low as possible. We have also seen the use of a small amount of pluronic F65 (0.3-0.5% w/v) or other nonionic surfactant in a Captisol® solution to improve the wetting and dissolution of the drug particles. How does pH affect complexation? The pH of a solution has the potential to effect complexation of a drug with Captisol® in several ways. If the drug has one or more ionizable functionalities, altering the pH will affect the extent of ionization of the drug. In general, complexation of drugs with cyclodextrins is strongest when the drugs are uncharged. However, since Captisol® is negatively charged at all relevant pH values, the presence of a positive charge on the drug can assist complexation via charge attraction. How does temperature affect complexation? If my drug candidate is ionized, will it still complex with Captisol®? Complexation typically occurs best with a neutral molecule. However, many anions have been shown to complex well with Captisol®, and because of the charge attraction (Captisol® is negatively charged), cations will often bind to Captisol® better than the neutral forms. See also "How does pH affect complexation?" Will I need to prepare and isolate the Drug: Captisol® complex for use in solid preparations? Successful formulations have been prepared using either physical mixtures (e.g., dry blend) of a drug and Captisol® or a preformed drug: Captisol® complex. Care must be taken in the design of the physical mixture dosage forms to assure that complexation will occur in situ. CyDex currently holds patents on the use of both formulation types. Captisol® is prepared as the sodium salt. How much sodium is present in Captisol® solutions? 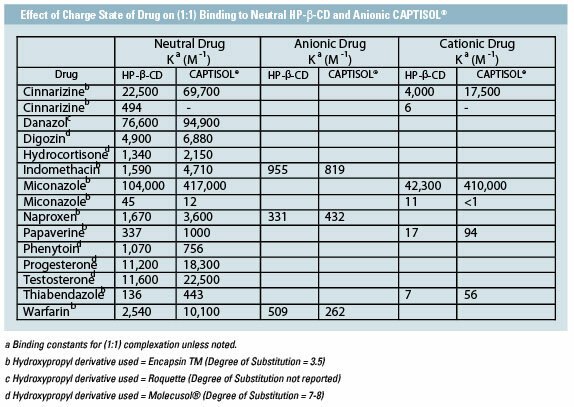 The table below indicates the various units for describing different concentrations of Captisol® solutions. Captisol® contains one sodium ion for each level of substitution. Contact us today and take the first step to a great partnership. © 2019 Captisol All Rights Reserved.